When you visit your dentist, you’ll be asked to schedule a dental cleaning. You may hear the term “deep cleaning” in reference to your appointment. Regular cleanings help keep your teeth healthy and free of tarter. A “deep cleaning” is a method used to treat periodontal disease. Regular dental cleaning should be performed every six months or so. A regular cleaning is designed to maintain healthy gums. With regular brushing and flossing and regular cleanings, gums stay pink and healthy, with little or no bleeding. A regular cleaning removes tartar, plaque, and stains from the surface of the teeth above the gum line. Your hygienist will use special tools to carefully remove plaque and tartar from your teeth. In patients who have not followed good oral health care procedures at home, or who have not had regular dental cleanings, pockets at the gum line may collect bacteria and tartar. Pockets which are more than 3 millimeters deep are a sign of periodontal disease. Your dentist may recommend a deep cleaning to remove deposits. Also known as “root planing,” deep cleaning involves removing tartar, toxic deposits, and bacteria from the roots of the teeth within the depths of the pockets. Since your dentist will be working below the gum line, you can expect some discomfort, but should not experience pain. Your dentist may apply an oral anesthetic, depending upon the extent of the necessary cleaning. The deep cleaning will require a follow-up appointment to continue to monitor and treat the periodontal disease. Following a deep dental cleaning, it’s important to follow your dentist’s instructions regarding at-home oral health care, and follow up regularly to maintain your overall oral health. Regular brushing and flossing, rinsing with antibacterial mouthwash, and taking advantage of fluoride and other treatments your dentist may offer are all recommended. Fluoride is a naturally-occurring mineral that helps protect the enamel of teeth against the acidic excretions of bacteria that live on teeth. As acids form on the teeth, they eat away at fluoride and other important minerals. Those minerals must be replaced with fluoride treatments to prevent damage to the enamel. Fluoride is sometimes found in certain foods and may be present in some water supplies. It can also be applied directly to the teeth by using fluoridated products like toothpastes, gels, and mouth rinses. While fluoride occurs naturally in the foods and water we take in, it’s role in helping to prevent tooth decay is a critical one, and your dentist may recommend additional fluoride treatments to ensure enamel health. Dry mouth- this may be caused by medical conditions, medications, or treatments like radiation therapy for cancer. Gum disease- A receding gum line may leave more of the tooth and roots, increasing the probability of decay. A history of frequent cavities- if a patient already has a history of cavities, your dentist may determine that fluoride treatments could offer better protection to the enamel, helping to protect the teeth. Having crowns, bridges, or braces- The presence of appliances in the mouth may create more nooks and crannies for bacteria to thrive. Fluoride treatments help prevent damage to the enamel and promotes better protection against decay. Whether you live in a community that adds fluoride to the drinking water, or get your fluoride through dental treatments and products, it’s important to talk to your dentist about the best way for you to get the optimum benefit from fluoride. Call for your appointment today, to explore the options for keeping your teeth healthy for a lifetime. Getting dentures means you can eat your favorite foods again. For patients who have gone weeks and months without being able to eat normally, this is a huge step. It’s going to take time, however, before you’re able to sink your false teeth into a juicy steak or eat complicated foods like corn on the cob. It will be necessary to learn some new habits in order to enjoy a full range of foods again. You may discover, to your dismay, that food doesn’t have the same rich flavors that you remember, at least at first. Food may taste dull. Give it time. Your brain is adjusting to a slew of new signals from the nerves in your mouth and gums. Your mouth and brain are out of sync as your nervous system adjusts to the sensations and signals needed for you to use your new dentures. Once the brain adjusts to the new signals, your taste buds should get back to normal quickly. Since your mouth is still adjusting, and depending upon the placement of plates holding the teeth, you may have a difficult time sensing temperatures. You’ll need to exercise caution when eating foods until you adjust to the sensations and learn to discern temperature. Stay away from very-hot foods to avoid the possibility of burning your mouth. When you begin learning to eat with dentures, start with softer food. Eggs, fish, chopped meats, cooked vegetables, pastas, soft fruits, and puddings are good examples. As you get used to the feeling of your dentures, try harder foods. Cut tougher foods, like bagels and tougher meats, into small chunks. Be sure to chew on both sides of your mouth, in order to equalize the pressure on your dentures. Denture adhesives may help improve the seal that keeps your dentures in place, and prevent seeds and other small kernels of food from getting underneath. Brush and clean them diligently when you’re not wearing them, to keep your mouth fresh and to avoid irritation. You’ve chipped a tooth, or are having a cavity repaired, but don’t want a traditional silver filling spoiling your smile. What are your options? Dental bonding and porcelain veneers are two different routes to the same goal- healthy teeth and a great-looking smile. Whether you’re considering the procedures for cosmetic reasons or need repairs, one of these options may be best for you. Although both procedures include covering the tooth surface with a protective material, there are some key differences between bonding and veneers. Veneers are thin pieces of porcelain or plastic that are bonded to the teeth. Porcelain veneers are individually created to fit the teeth. They are more expensive than composite, but last ten to fifteen y ears or more. When applying porcelain veneers, your Dr. Gardner will need to shape the tooth to prepare it for the veneer. Composite dental bonding material can be bonded to the teeth in a single visit. The composite material requires only a slight roughing of the surface of the tooth to enable it to bond. This material lasts five to seven years. Dr. Gardner will apply the resin, shaping and coloring it to match your natural teeth. The resin is then hardened using a special high-intensity light, before it is polished. The choice between veneers and composite bonding depends upon your specific situation and goals. 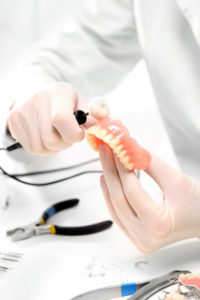 Composite bonding is best for emergency repair of a chipped or broken tooth, as the process takes only one visit. For those looking for a more permanent solution for a perfect smile, porcelain may offer more durability. Cost in both terms of time invested and finances is lower with composite bonding. If a long-lasting, perfect smile is an important goal, porcelain may offer the best solution. If the desire is to repair a broken or chipped tooth, or to achieve a more attractive smile at a reasonable cost, composite bonding is an excellent solution. If you are in the James Island, SC area, come in for a consultation at Three Trees Dental and discover whether dental bonding or porcelain veneers are right for you. You may squirm a bit when your hygienist asks if you floss every day. Most adults don’t brush their teeth twice a day for at least 2 minutes at a time, either. The American Dental Association recommends twice a day brushing and flossing at least once a day for optimum oral health. Why is flossing so important? Here’s a hint: it’s not to keep the floss companies in business. While brushing cleans the tops and outer surfaces of teeth, flossing is the only option that gets to those tricky spots in between the teeth. Whether you use traditional floss, dental flossers, or an interdental brush, it’s important to clean the tiny spaces between teeth where plaque can hide and build up, leading to cavities and gum disease. Gingivitis is an irritation and swelling of the gums caused by plaque buildup and microbes that live in the teeth. When left untreated, gingivitis causes the gum tissue to become red and inflamed, and to bleed easily, creating, even more, areas for bacteria to take hold and thrive. 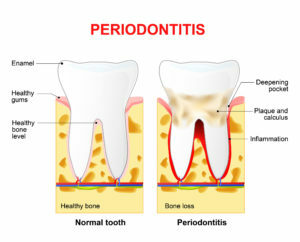 Gingivitis leads to periodontal disease. The resulting bacteria can enter the bloodstream and travel throughout the body, leading to major infections. The same dental plaque that leads to gingivitis shelters the harmful bacteria that attack the enamel of your teeth, and may cause cavities between the teeth. Flossing need not be a time-consuming process. Done correctly, flossing can be completed in just a few minutes each day. Start with about 18 inches of floss, and wind most of the floss around your middle fingers, leaving a few inches to work with. Hold the floss tightly between your thumbs and index fingers, and slide it gently up and down between each tooth. 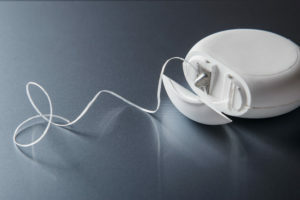 As you move to each new space, re-wind the floss so that you’re using a clean section for each tooth. Slide the floss gently between your teeth, using a back-and-forth motion to clean any plaque or debris from the gap. Put gentle pressure on each tooth as you move up and down, ensuring that you clean each tooth thoroughly. Avoid pressing the floss against the gums. Proper flossing not only helps you keep your smile whiter; it helps ensure ongoing dental health. Plaque is the nasty yellowish film often left behind on your teeth at the end of the day. It is removed with brushing and flossing, but it is the symptom of a larger problem – cavity-causing bacteria colonizing your mouth. Plaque is the home of microbes which produce acids which, in turn, attack the enamel on your teeth, causing decay and cavities. The foods we eat also feed the bacteria, so it’s important to be aware of what you’re putting in your mouth, and how it affects your oral health. Did you know that not all candies are created equal? Sour, chewy, and hard candies are actually worse for your teeth than chocolate. Sour candies not only contain sugar, they also have acids which contribute to the breakdown of the tooth enamel. Chewy candies stick to the teeth, making them more difficult to remove, even with good brushing and flossing habits. 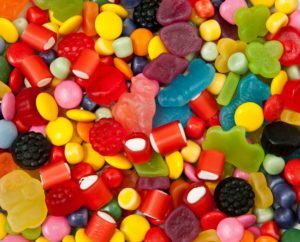 Hard candies, when chewed, may actually crack the enamel, giving the bacteria in the mouth even greater access to continue chipping away at the protective layer. Chocolate and other “soft” candies don’t crack the enamel of the teeth and are easier to clean away with a thorough brushing and flossing. If you indulge in an occasional sweet treat, be sure to brush thoroughly soon afterward. Candy isn’t the only food that can be harmful to teeth. Bread, cookies, and other simple starches break down into sugars during the digestive process. Those sugars then feed the bacteria, which go right on producing their tooth-attacking acid. Opt instead for whole wheat and other whole grain breads which contain less sugar and more complex starches which are more difficult for acid-producing bacteria to digest. Soda, obviously, contains large amounts of sugar. Many sodas also contain acids that can damage teeth. Alcohol and soda share a common trait as well- both dry out the mouth, reducing the amount of saliva present. Saliva helps rinse the teeth of harmful bacteria. When drinking soda, use a straw to bypass the teeth. Alcohol should be closely followed with water to keep the mouth well hydrated. Avoid excess of either beverage and opt instead for plain water as often as possible for healthier teeth. A baby’s emerging teeth are a milestone parents will talk about for the rest of their child’s life, but too few remember that it is also the time for a first visit to the dentist. As parents, we want what’s best for our children. Pediatric dental visits help prevent cavities and tooth decay. Parents can learn how to care for their child’s emerging teeth, and give them a healthy mouth from the very start. With the help of pediatric dental visits, parents help begin to instill good oral hygiene habits from the beginning. 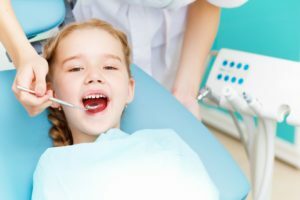 Regular dental visits in the early years teach children that the dentist’s office is a friendly place, and alleviates much of the anxiety expressed by older children. Not only do regular, early dental visits prepare your child for good dental hygiene later on, it provides parents and caregivers an opportunity to learn tips and techniques for caring for children’s teeth at home. While there is a misconception that “baby” teeth are less important than the adult teeth that emerge later on, the development of a child’s mouth depends upon the healthy growth of the first teeth. The emerging baby teeth create the pathways that adult teeth will follow growing in. Early care of the first teeth helps ensure that the permanent teeth will have a healthy start. 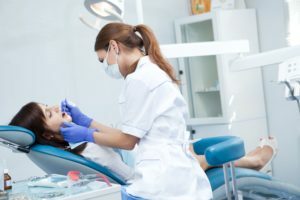 Although dentists are famous for discouraging thumbsucking and pacifier use, the truth is that those habits are not harmful, if they are not continued over a long period of time. While very-young children may rely upon these oral comfort items, it’s best if the habits are discontinued by the time the child is three. 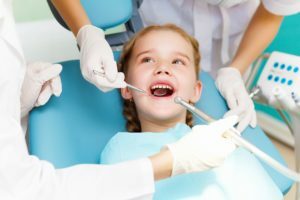 Your dentist can recommend techniques for teaching your child other self-soothing habits that will help wean them away from sucking as a comfort. Regular treatment and care of your child’s teeth by a pediatric dentist can help ensure good oral health later on, and prevents cavities and other oral diseases. Early dental visits help lay the foundation for good health later on and throughout your child’s life. Visiting the dentist is often the last way people want to spend an afternoon. Most people associate the dentist with drilling, pain, and anxiety. Regular dental visits can reduce or eliminate those fears and the need for more invasive interventions. With good dental hygiene and regular care, cavities and other dental problems can be avoided. Even the most dedicated tooth-brusher is going to miss spots of plaque and tartar build up. Brushing and flossing are an essential part of your dental hygiene routine, but they’re not enough to protect your teeth. You need regular cleanings to keep your pearly whites in tip top shape. Cavities don’t give you any warning that they’re beginning to form. The first clue most of us have that a cavity is forming is the telltale ache when the tooth deteriorates far enough to expose a nerve. By then, drilling and filling is necessary to repair the tooth. Regular dental checkups allow you to catch cavities early on, when the repair is relatively simple and it’s not necessary to take more drastic measures like a root canal to repair the damage. Gum disease doesn’t just mean that your gums bleed when you brush. If your gums begin to break down, more of the tooth is exposed to bacteria, putting you at higher risk for cavities and tooth loss. Gingivitis causes the gum to pull away from the tooth, leading to more tooth decay and loss. As gum disease progresses, it can begin to break down the bones that hold the teeth. Drastic treatment methods would be necessary by a dental specialist. Early detection and treatment can stop gum disease and prevent major problems down the road. There are lifestyle choices and habits that have an impact upon your dental health. Obvious things like smoking may come to mind, but more subtle problems like nighttime tooth grinding can cause pain in the jaw and tooth loss due to excessive wear. Your dentist can spot damage early and prevent tooth loss with regular visits. In-office x-rays can pinpoint problems that aren’t immediately obvious or visible on the surface. Don’t take chances with your dental health. Contact Three Trees Orthodontics today, and make your appointment. You’ll be glad you did. Choosing the best dentist for your family is not always an easy choice. What makes Three Trees Dental the best James Island dentist? We believe in treating the whole person, not just the dental issue. With our caring staff, our calming atmosphere, and our dedication to offering high quality, innovative care to our patients, we believe we are the best choice for your family’s dental care. We are extremely fortunate to have a top team to look after our patients. From our hygienists to our assistants to our administrative staff, we all work together to offer you and your family the best possible care. We don’t just serve the Charleston community; we’re part of the neighborhood. We don’t just “drill and fill” teeth. We offer periodontal care, root canal therapy, cosmetic procedures, treatment for TMJ, and dental-related sleep apnea. Whether you come to us to deal with dental pain, trouble sleeping, or want to improve the appearance of your smile, we can help. Perhaps the most important feature of Three Trees Dental’s office is our dedication to offering top quality care for the entire family. We offer pediatric care to introduce your little one to oral health care early on, as well as offering the services your children need as they grow, like orthodontic services, whitening, veneers, and sealants. From the time your child’s first tooth erupts, to planning for braces for your pre-teen, to young adult, adult, and senior dental care, we have you covered. We provide excellent, gentle care for the whole family. Dr. Gardner and our staff look forward to caring for you and your family’s James Island Dentist needs. Call or go online to make your appointment with the best James Island Dentist today. When it comes to choosing the best family dentist on James Island to handle your family’s oral health care, there are questions you should ask about your provider to help you make the right choice for you and your family. Whatever your dental needs may be, Three Trees Dental offers the family dentistry care you need. Each family is as unique as the individuals it contains, and each individual has different requirements. Very young children are getting their first teeth. 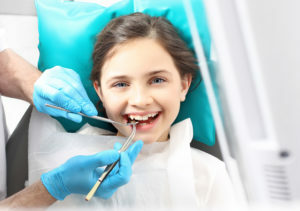 It’s important to introduce them to the dentist as soon as possible, so that they become familiar and comfortable with the office, equipment, and procedures early on. Families with very-young and elementary-aged children will appreciate the gentle, caring approach Dr. Gardner takes to his patients. As children age into teens and young adults, it’s important that they are given more options and input into their own care. Dr. Gardner takes the time to explain the available options fully. Establishing strong and lasting relationships with our patients is a priority at Three Trees Dental. Dental health is about more than just having an attractive smile. Medical conditions associated with dental health, like sleep apnea and TMJ Disorder can have a severe impact upon overall health. We believe in treating the whole patient, not just the teeth. In addition to addressing health questions, Dr. Gardner understands the confidence that comes from having an attractive smile. He works hard to provide patients with treatment options for repairing stained, damaged, or missing teeth. Whether you come to Three Trees Dental seeking treatment for a cavity or are interested in veneers, we have a treatment option for you. Book an appointment with the best family dentist on James Island today! Call us at 843-795-5565 to schedule your next dental appointment. Or visit our appointment page, we have made it so easy too—just fill out our online form! You don’t even have to make a phone call. We are excited to partner with you in making 2017 the best year yet for your teeth.